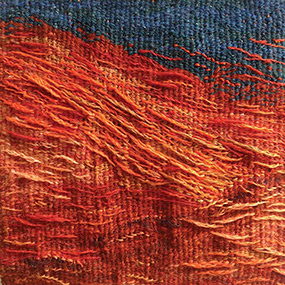 The British Tapestry Group exists to promote woven tapestry as a contemporary art form in the UK, by raising public awareness through professional exhibitions, networking, regional initiatives, training and development. 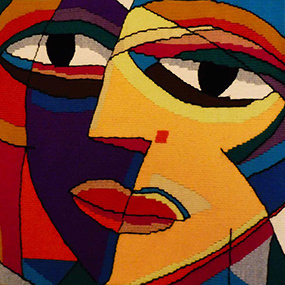 We are a group of 250 UK and International tapestry weavers, many of whom are award winners and renowned artists. The BTG Woven Art website showcases the combination of craftsmanship and artistic inspiration which is translated into woven works. An exhibition of tapestries by Scottish members at Dunblane Museum, Dunblane 9th - 31st August 2016. An exhibition by members in South East England held at The Mill House Angmering 23rd March - 3rd April and at The Arts Forum, St Leonards on Sea, East Sussex 19th April - 1st May 2016. An exhibition by London members held at the Hepsibah Gallery Hammersmith 9th -19th June 2016. 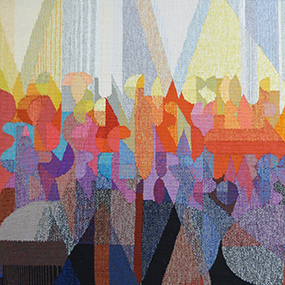 An exhibition by members of the British Tapestry Group held at K&S London & Harrogate 2014. 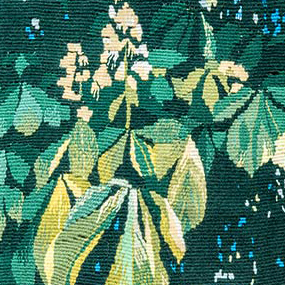 An exhibition of small format tapestries, woven by Scottish Members held at The Verdant Works, Dundee, 25th July to 8th October 2015. Many of the tapestries have links to the city. All intellectual property rights (IPRs) in the contents of the British Tapestry Group website and BTG publications (Contents) belong to either individual BTG members or their licensors. All IPRs and related rights are reserved. No Contents or part of them may be reproduced without the IPR owner's prior written permission.